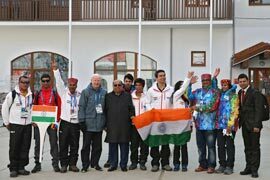 Indian delegation at the flag-raising ceremony in the Olympic village in Sochi. Second from left: skier Nadeem Iqbal. Fourth and fifth from left: President of the European Olympic Committee Patrick Hickey and head of the National Olympic Committee of India Narayan Ramachandran. Fifth and sixth from left: skier Himanshu Thakur and luger Shiva Keshavan.